A custom VR experience made to bring campus to life and drive enrollment. 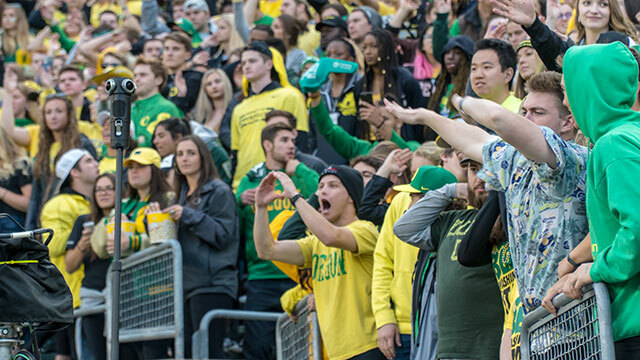 The University of Oregon was looking for a vendor to produce a VR experience with the goal to drive more enrollment. Today’s VR technology has enabled universities all over the globe to transport prospective new students to the campus, experience campus life, and explore the university before making that all important decision. Traveling to Eugene, especially from other parts of the country, can seem like a difficult and expensive hurdle for some families. With VR technology we have made the University of Oregon campus accessible to nearly everyone, regardless of where they live. It was important for UO to do something different. They didn’t want the same old tired campus walkthrough that everyone else has done, they wanted to be innovative and offer a truly interactive experience where the future student could pick and choose where to explore based on their interests. Our suggestion was to build a unique virtual experience from the ground up, making use of 360 panoramas and videos, and incorporating campus video assets and information throughout. An aerial panoramic world-view of the entire campus would be the central hub for all navigation. 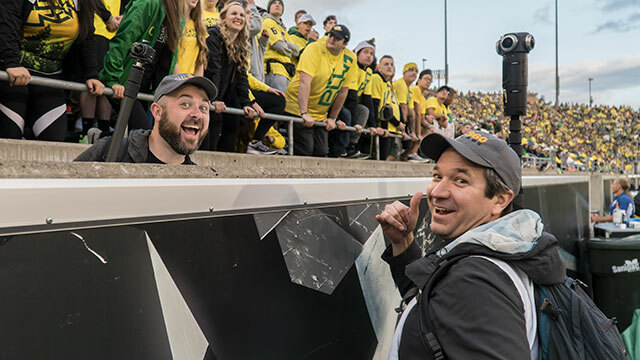 We worked closely with UO on scheduling several panoramic photography sessions and 360 video shots around campus, working to maximize our time on location and waiting for the perfect weather window. Incorporating the use of DSLR cameras for panoramic photography and the Z-cam S1 Pro for 360 videos, we covered a variety of experiences for all interests, from science labs to football games. We also recorded spatial ambient audio at each location, for an immersive feeling of actually being there, even in the still 360 photos. We brought in AirView Cinematography to provide expert drone piloting services to fly our 360 cameras. With a team carefully watching foot traffic, we ensured the safety of everyone on campus while operating the aerial platform. The resulting aerial panoramas and 360 videos offer a thrilling and fun “Duck’s-eye view” of the campus. We collaborated with partners at PlatformVR, experts in VR app development, to build custom Google Cardboard applications for iOS and Android. Users navigate and explore the campus by placing their mobile device into a Google Cardboard viewer, or those without a viewer can simply hold the phone and swipe to explore. Bandwidth is always a concern with high quality 360 video content at 4k resolution, so we were able to utilize the university’s own Vimeo channel by implementing the Vimeo API. All of the 360 video content displayed within the application is served from Vimeo. We also wanted a way to collect feedback from users, knowing more about what they liked in the experience or visited most. To help with that, we added a feature to select a scene as a “favorite,” which saves a scene as a bookmark in the UI so that they can easily get back to it. This also gives us valuable data for future updates, knowing which types of experiences people enjoyed most. A call to action was key, so we planned for a smooth transition from the headset back to the phone where a student could reach out to admissions for more information. The university mailed around 20,000 custom branded Google Cardboard viewers as a special gift to admitted students. Each care package came with a personal message from the Duck. A landing page on the university’s website explained how to download the apps and use their new cardboard viewer, a hilarious video created with students explains the simple and fun process. The apps are publicly available for download in the Google Play Store and Apple App Store. UO also launched an involved digital campaign including a social media strategy, promotional videos and a detailed blog article about the project and the student involvement. Within a month of launch, the apps had accumulated more than 10,000 downloads. As an innovator in the space, they also benefited from a lot of media attention from local and national news outlets. The campaign was covered by many broadcast stations across the country and several print/online publications. In her words, “This is about bringing the campus to life,” and this was certainly what we set out to accomplish with this project. 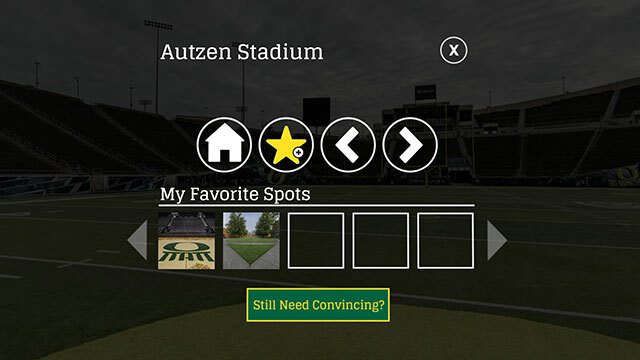 A year later in 2019, University of Oregon decided to add new features and updates to the apps in a phase 2 project. 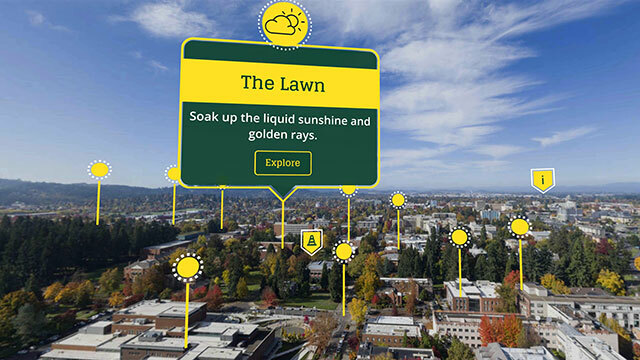 You can now shapshot and share your current point of view of your favorite places on campus, bookmark 360 videos for easy access on your favorites list, and watch new content added by the media team there at UO. Due to the success of the campaign and the rave reviews from recipients, they will also ship another run of custom Google Cardboard viewers to prospective students this year.